oliviahaynes | Swan Canoe Club Inc.
Hope you’re having a fantastic start to November and all enjoying the sunshine! Our club has some very exciting events coming up and it would be so fantastic to have you at them. There are all kinds of events from a day trip to Penguin Island, right through to Christmas Holiday Classes to get enrolled in. We look forward to seeing you at this events and make sure you take plenty of snaps to tag us in on Facebook and Instagram. See you out on the water. SCC Monthly paddle for Club members old and new. Join Sarah for a paddle around the local waters and to finish off we will stop for a coffee in Freshwater Bay to check out the new Cafe. Contact Sarah: 0401591312 or email sarahjwhittaker@hotmail.com. RSVPs a must so that she knows numbers to expect and if another instructor is required. 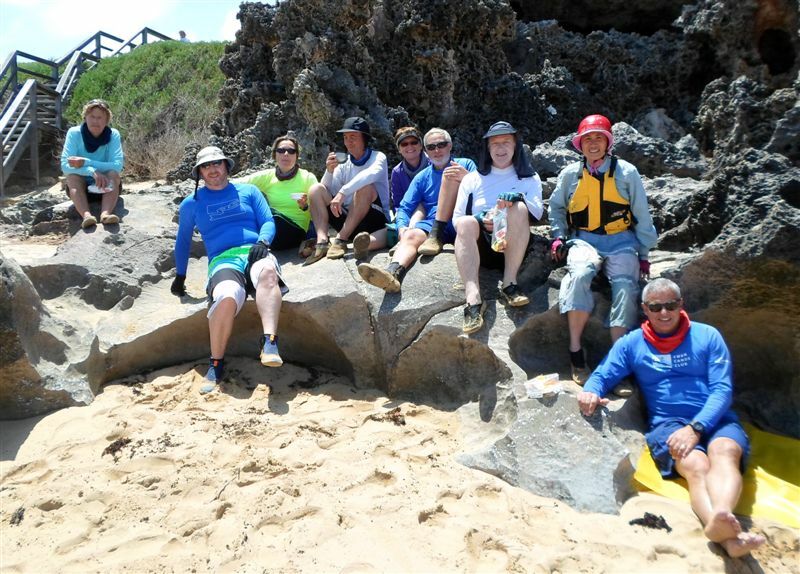 Depending on the weather forecast and ocean conditions, this paddle usually starts just south of Rockingham, taking in Point Peron and Seal Island before reaching Penguin island. If time and conditions allow paddlers will circumnavigate the island before landing on the island for a break and lunch (BYO). Following lunch paddlers will return to the start point. This is a fairly safe and comfortable paddle, especially for those who may not have had much experience of paddling on the ocean. Good opportunity to explore the small islands offshore and get close to the local wildlife. Only those paddlers who have completed the SCC Intro to Sea Kayaking or are able to provide the instructor with proof of their ability to safely paddle on the ocean are able to attend this trip. Paddlers must provide their own craft, suitable for paddling on the ocean. If you do not have one you can hire one from the club, please contact the SCC boat hire officer. This is an event that’s worth, not missing! We have some great things planned for the evening. The event will kick off following the Club Race (Approximately 6:30 pm), the BBQ will be on at 6 pm. 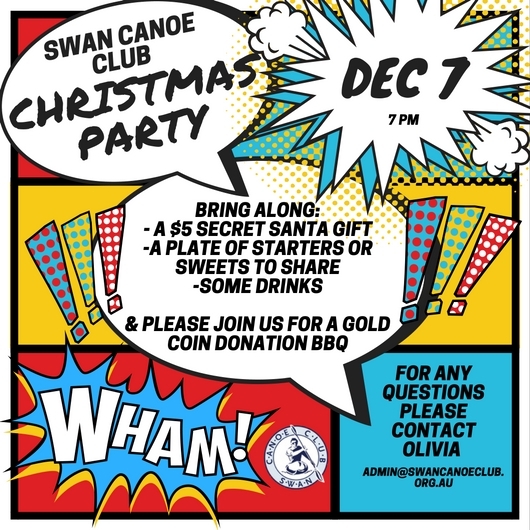 Please RSVP if you are attending to admin@swancanoeclub.org.au so we know to expect you. This course is normally conducted on the Swan River as it concentrates on the skills required for controlling and maneuvering a sea kayak in calm conditions. This course is designed for people who have some previous kayaking experience and have the ability to perform basic paddling strokes. A reminder to all members – Everytime you leave the club make sure you have closed the roller doors, turned off the lights and locked all windows and doors. Whether someone is still at the club or not, it is so important to make sure the club is secure. Please note that clubroom facilities are unavailable on the following dates due to the venue being hired out. You will still have complete access to downstairs, however, please be mindful there will be functions upstairs. Thank you to Paddlesports Megastore for their continuous support to Swan Canoe Club. 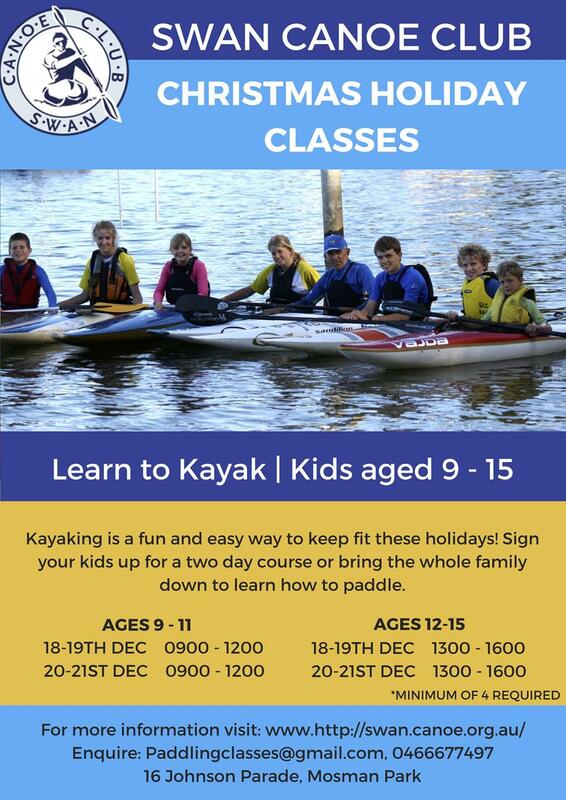 We invite you to involve all Juniors in the Swan Canoe Club – Christmas Holiday Classes. 2017 brings an exciting program that welcomes you to learn to kayak. Kids aged from 9-15. The cost of the Christmas Holiday Classes is $100 per person to be transferred. Being a Swan Canoe Club member is not necessary. 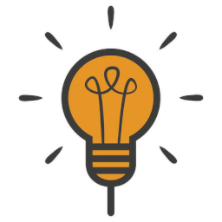 IMPORTANT INFO: Participants must have done and passed the Intro to Kayaking Course or have equivalent experience Participants MUST wear either on themselves or their kayak a bright continuous light that can be seen from all directions! Swan Canoe Club is disposing of a number of older kayaks and skis as part of the regular renewal of the club fleet (list below). The following boats are available for purchase by club members on an as seen, as is basis. The boats can be inspected at the club boat shed and are currently tagged with a for sale notice and you can check the asset number against the list (this is usually a red tag attached to the stern deck handle or rudder assembly). Members interested in purchasing a boat are encouraged to provide a bid by email to the club administrator by COB from Friday 27th October – Friday 10 Nov. Boats will be sold to the highest bidder and must be removed from the club within 1 week. Boats not sold after this process will be sold on the open market. 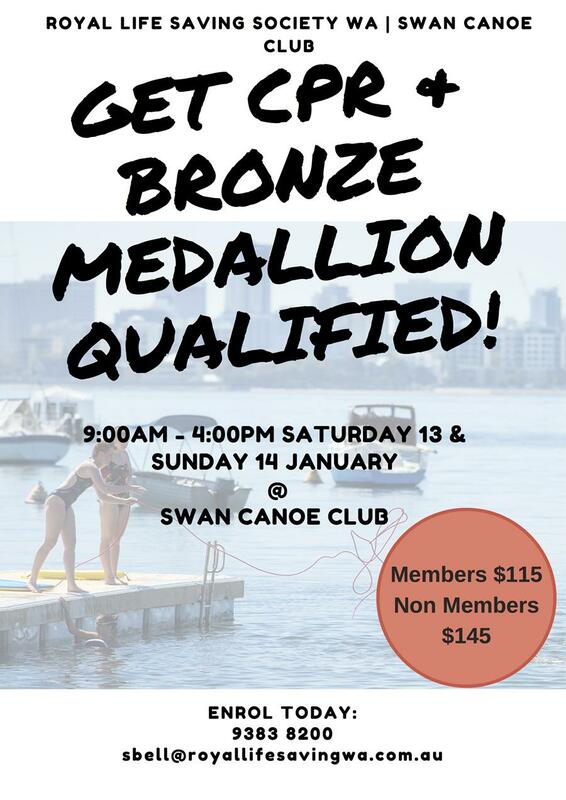 Olivia (Club Administrative Officer) admin@swancanoeclub.org.au 0405 565 495. That you must at all times close doors and switch off lights when you leave the club – peoples personal boats and equipment are stored at their own risk and we should be mindful of other property at the club as well as our own. We want to make sure that everyone’s belongings are as safe as possible at our club. This couple of weeks have seen such exciting times for our club with the Open Day on Sunday, the Busy Bee and this week welcoming our Inaugural SCC Club Night and Time Trial. We wanted to thank everyone for volunteering your time – we couldn’t of run the day so smoothly without you on Open Day, not to mention the club spirit was so high it was really fantastic. Another thank you is in order is to those of you who volunteered to help with the Busy Bee. There was so much amazing work done, it’s safe to say that our club looks as it looks as clean as a new pin! It is the community component to our club that makes us so lucky to have our beautiful second home. We invite SCC members to renew their membership as it is now due (exp 30 Sept 2017). With an exciting year ahead of events including club nights, paddle groups and plenty of new events popping up! SCC is proud to say we are a community that continues to grow and pride ourselves on our members, so we look forward to another year with you as a SCC member. Fob deactivation will occur in the next two weeks so it is important to make sure you have renewed. 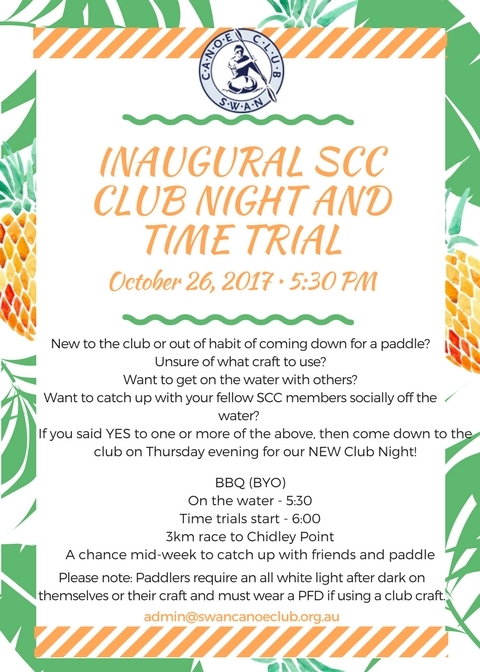 We are delighted to remind you of the Inaugural SCC Club Night and Time Trial this Thursday (26th October). This night will be an opportunity to open Thursday Club Nights. We would love to see you out on the water and after for a BBQ and chat welcoming all suggestions for Club Nights in the future. 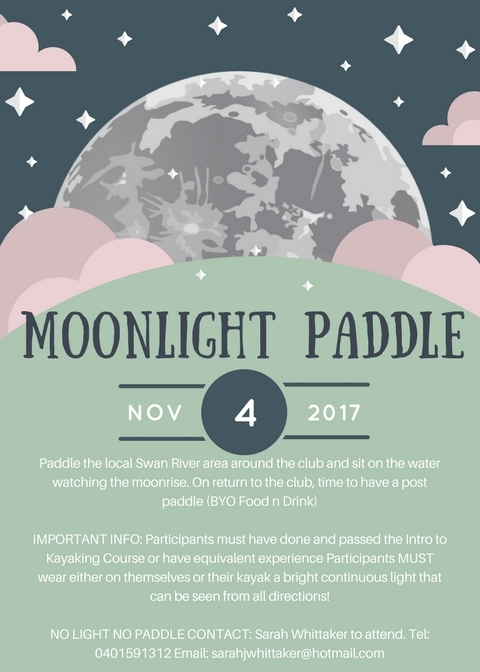 Please note: Paddlers require an all white light after dark on themselves or their craft and must wear a PFD if using a club craft. Stay tuned on the Website, Facebook or Instagram.